Der Artikel Huijun Gao: Nonlinear Stochastic Systems with Network-Induced Phenomena wurde in den Warenkorb gelegt. Ihr Warenkorb enthält nun 1 Artikel im Wert von EUR 112,58. 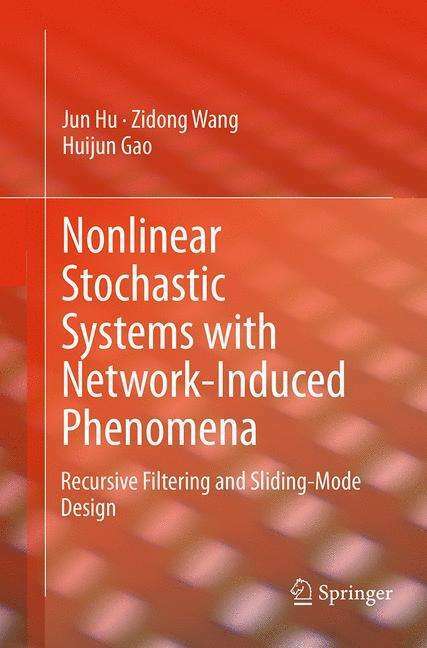 This monograph introduces methods for handling filtering and control problems in nonlinear stochastic systems arising from network-induced phenomena consequent on limited communication capacity. Such phenomena include communication delay, packet dropout, signal quantization or saturation, randomly occurring nonlinearities and randomly occurring uncertainties. · their potential for application in networked control systems, and concluding with some ideas for future research work. New concepts such as the randomly occurring uncertainty and the probability-constrained performance index are proposed to make the network models as realistic as possible. The power of combinations of such recent tools as the completing-the-square and sums-of-squares techniques, Hamilton¿Jacobi¿Isaacs matrix inequalities, difference linear matrix inequalities and parameter-dependent matrix inequalities is exploited in treating the mathematical and computational challenges arising from nonlinearity and stochasticity. Nonlinear Stochastic Systems with Network-Induced Phenomena establishes a unified framework of control and filtering which will be of value to academic researchers in bringing structure to problems associated with an important class of networked system and offering new means of solving them. The significance of the new concepts, models and methods presented for practical control engineering and signal processing will also make it a valuable reference for engineers dealing with nonlinear control and filtering problems.